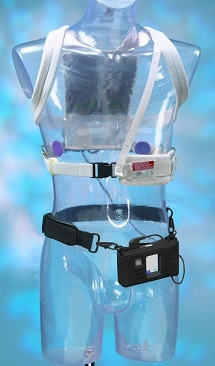 The FDA has approved the Life Vest Wearable Cardioverter Defibrillator. The Zoll Wearable Defibrillator has been in use for years, but was not FDA approved for the pediatric population — only in the adult population. When the werable defibrillator detects an abnormal heart rhythm, such as ventricular tachycardia, an alarm goes off — this enables the patient to prevent the shock by happening if they are alert or asymptomatic. The device then gives a verbal warning before the high energy shock is delivered. Before the high energy shock is delievered, a blue gel within the electrodes releases. The wearable defibrillator can now be used for pediatric patients who are at risk of sudden cardiac arrest and are not candidates for implatable defibrillators. If you haven’t downloaded it already, a great free innovative medical app related to cardiology is CRMD finder. CRMD finder enables you to identify implanted cardiac devices (ICD) based on chest x-ray results and is one of the best cardiology medical apps we’ve reviewed.